The BA Insider is a free email publication written by the Market Development Committee. The publication is sent quarterly by the Brewers Association. Each issue covers topics relevant to craft beer distributors. Below you will find the third quarter article, which explores growth in the craft beer segment and what we can expect to see by 2020. 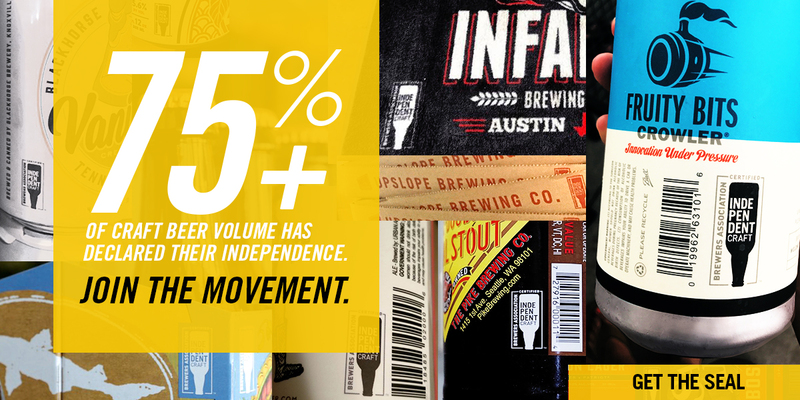 As craft brewers, we have seen incredible growth over the last five years. At the end of 2013, craft was 7.8% of the 196 million barrels of beer sold domestically (flavored malt beverages not included). Craft continues to be one of the fastest growing segments in the beer category, posting annual growth of 17.2% by volume in 2013. Based on size and growth of the segment, craft is the number one driver of incremental profit in the beer category and it doesn’t appear to be losing momentum. These trends have not diminished in 2014. Year-to-date sales for the craft segment are at a higher level than 2013, up 20.9% ending the week of 6/22/14 in IRI MultiOutlet tracking (grocery, drug and supercenters). This volume is being supplied by the more than 3,000+ craft brewers, all enthusiastically brewing and selling their beers to a thirsty audience. The sky—or a large part of the 196 million barrels of U.S. beer volume—seems to be the only limit for craft beer. This growth rate seems frothy by any standard and it begs the question: “Can it continue?” The Brewers Association (BA) has a stated goal of 20% share of volume for the craft segment by 2020. The mantra is “20 by 20.” Based on the trends cited above and the fact that markets like San Francisco, Portland, Seattle and Boston are already above the 20% share mark, it is easy to forget that the many markets across the country are still just beginning their craft journey. For the following reasons many believe 20 by 20 is not only achievable, but a predictable result of demographic, market and growth trends. 1. Millennials are the major population force now and into the future, and they drink craft! 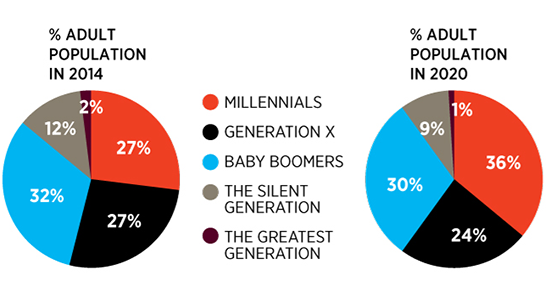 We have all heard of the Millennial generation. 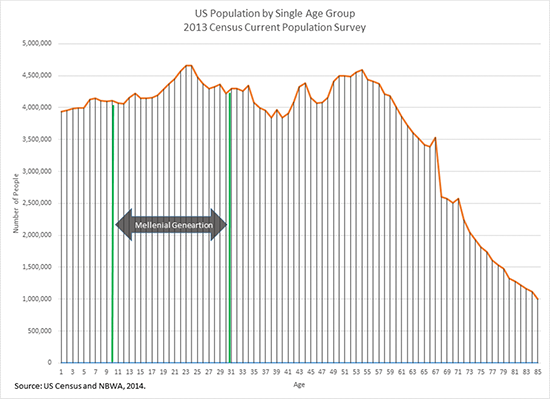 Depending on the source, there are slightly varying definitions of this group available, but typically it is defined as the 80 million people born between 1977 and 2000. This makes them larger than Baby Boomers and 20% bigger than Generation X. Millennials make up 25% to 27% of the U.S. population (depending on the definition of the group) and have 21% of the consumer discretionary purchases, estimated at over a trillion dollars of direct buying power*. Their influence on all categories of products is being felt now. By 2020 they will be 36% of the adult population and will be the dominant consumer force. Lucky for us this group loves craft beer and is increasing its share within craft beer lovers faster than any other age group. Between 2011 and 2013, 80% of craft growth came from new craft appreciators, the majority of which were in the 21 to 29 age group, and their impact is still muted. Lester Jones of the National Beer Wholesalers Association (NBWA) sees Millennials as not fully economically activated yet due to the impact of the economic recession and their struggle to transition into aging Baby Boomer jobs. This means as the economy improves we should feel the impact of the Millennials even more. The message here is the fastest growing and most influential demographic is also moving the fastest toward craft. You see it in all classes of trade, including bars, restaurants, liquor stores, club stores and even Walmart. More and more craft brands from small and independent producers are being offered and sold. This isn’t happening just because retailers like craft brewers. It is happening because there is a fundamental, long-term shift in the beer category that supports craft growth. The biggest macro trend in place since the 1970s has been premiumization—the growth of premium light beer and decline of full calorie premium brands. This shift has coexisted with the increase in better beer consumption, among imports and craft beers alike, and has continued through today. 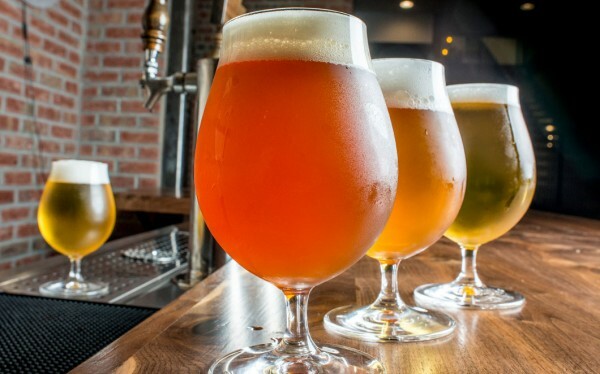 The growth of imports and craft is the beer category’s manifestation of premiumization, which most categories of products, particularly consumer products, have been going through for the last decade. Trade-up and premiumization have been evident among the likes of Starbucks, Dove Bars, Grey Goose Vodka, Patron Tequila, single pressed olive oil and Stilton cheese. High-end wines and spirits are now over 35% volume share of their respective categories versus 24% for craft and imports in the beer category (higher with domestic specialty and other premium plus offerings). Premiumization is happening in beer but is still behind our beverage alcohol cousins. Craft’s quality, flavors and stories are where real premiumization exists within the beer category. The new phenomenon in beer is the decline in light beer growth and the rapid acceleration of craft. If this is truly an inflection point in light beer’s share and this decline continues, craft will be the beneficiary of even more potential volume from drinkers looking for alternatives to light beer. 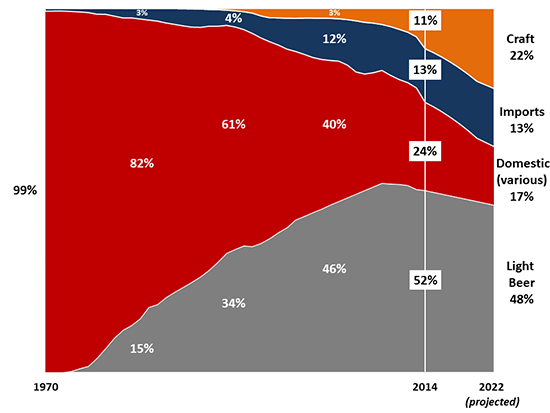 How much does craft need to grow to hit the 20% volume share of beer by 2020? Category growth (CAGR) of 11% for the next seven years. Based on current trends, 2014 will end in the high teens, with market volume share approaching 11%, so if the following six years deliver 11% growth then 20 by 20 will be achieved (assuming flat overall beer volumes). We have seen this growth over the last four years and believe that even if some larger, more developed craft brands slow in growth, the influx of new brewers growing at high rates will support the overall 11% growth number. There is a lot of room for more beer as the large premium brands decline. Large and small craft brewers are positioned to take that volume. 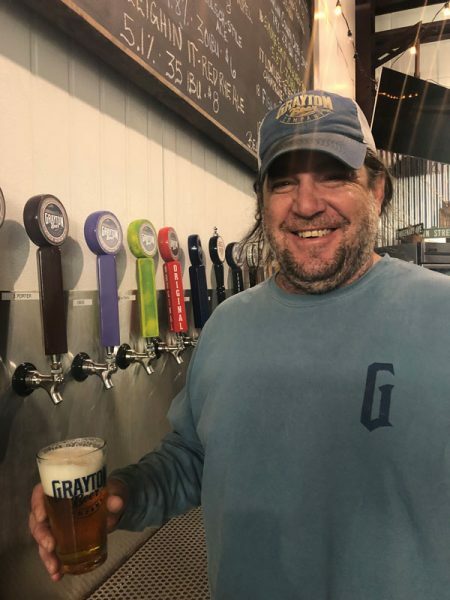 Our primary job as craft brewers is to continue to nurture and grow this great market for flavorful beer that we have developed over the last 30 years. We need to keep driving differentiated brands of quality and affordable beers. Our beers need to be fresh and exciting with tastes that drive the drinkers to come back for more. We need to continue to support all quality-minded brewers and support their efforts to get a fair shot at brewing and selling the best beers in the industry. Craft is still new to most beer lovers and we need to introduce it with that understanding. Retailers, consumers and distributors need help in understanding the beer we make and how to sell it. We need to help make it easy for our downstream constituents to sell and buy them. If we do all of this and continue to ride the trends of millennial enthusiasm, premiumization and robust sales, 20 by 20 should be bottled and ready to deliver! View past issues of the BA Insider and more under Beer Distributor and Retailer Resources.